When the wonderful family at Natural Linens contacted me, I saw this as a great opportunity to take another step in the direction of saving money, reducing waste, and I get to give a great organic product! When looking over their store, I was intrigued by the thought of unpaper towels. We go through a good bit of paper towels in this house, much to my aggravation. So, what did we use the unpaper towels to do? They are awesome for cleaning glass and windows without leaving streaks or fuzz. They worked beautifully when disinfecting the kitchen counters. I was able to clean all of our doorknobs, door frames, and light switches with only one unpaper towel as opposed to 7 or 8 paper towels. They make quick work of bathroom sinks and counters with only one unpaper towel for three bathrooms. I love how thin, yet absorbent they are. I much prefer them to wash cloths when cleaning the bathrooms and kitchen, and they are perfect southern napkins! Next, I would love to make the switch to cloth coffee filters and tea bags! Now YOU get the chance to win a set of their fantastic unpaper towels! You know me, I like to make entering giveaways and getting additional entries easy. How do you enter? Simple! Pop over and visit Natural Linens Etsy store and choose a product they offer that you are not already using. Post a comment below telling me what that product is. That’s it! This giveaway will end at Midnight (12:00 am) on Sunday December 8th. One winner will be chosen via Random.org. The winner will be announced here on the blog and emailed and will have 48 hours to respond or a new winner will be chosen. Thank you for joining in this giveaway and supporting a small family owned business. Every time you share them with someone or make a purchase, you make a difference for their family! Thank you! If you are like me and look for every great idea to trim your grocery budget, then you have already discovered the awesome grocery budget fat buster of menu planning. Menu planning alone has not only helped reduce our costs, but is has also reduced food waste and given us far better meal options. When you know what is being prepared and you have all of the necessary ingredients, then it is not a crapshoot to try and pull a healthy, filling meal together. Up until a few weeks ago, I was the menu planner. I checked our pantry and freezer stock to create a menu for the week as well as a grocery list. Then it it hit me. I have THREE teenagers and at least 4 of our children can cook! Why am I the only one making these decisions and getting everything lined up for the week? Enter in operation FAMILY Meal Planning. After a little powwow, we came up with a new strategy, not only for meal planning but also for meal preparation. No longer is it a toss up as to who is going to cook, what they are going to prepare, and on what night will they be doing so. Our oldest three, Renee (16), Noah (14), and Emily Grace (13), and the team of Hannah (10) and Dad each take a night to fully plan and prepare dinner for the family. I take the three nights that they do not claim. Each one of our chefs-in-training puts together all aspects of the meal and makes sure that we either have the ingredients or they are written on the grocery list. When I head out to Costco with my list, I know that we will have exactly what need for the week’s breakfasts, lunches, snacks, and dinners. It does my momma heart good to see them researching new dinners to create. Thank, you Pinterest! they are learning timing and time management to get all parts of the meal ready and on the table at the same time. there has been finally come about a realization that they cannot “graze” in the pantry and fridge all of the time and still have what they need to prepare their meals. bonus, this has worked so well, that they have also taken over lunches. I love that my older kids will not be dependent on a microwave or takeout to eat in those beginning adult years that are in the very near future. You never know, this may bring out a passion for cooking and a direction in life one of them never thought about. In your home, do the parents do all of the cooking? 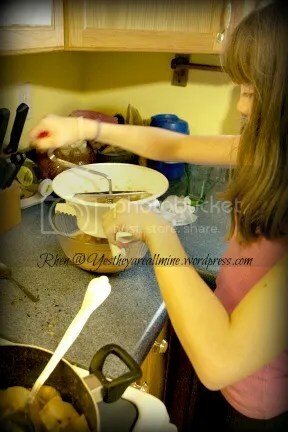 Do you have teenagers who cook? If not, now is a great time to start something new and get them interested in preparing fantastic meals and stretching themselves as chefs! When you were a teenager, what were some of your favorite things to cook? Mine, steak bites with onion and peppers. Yum! 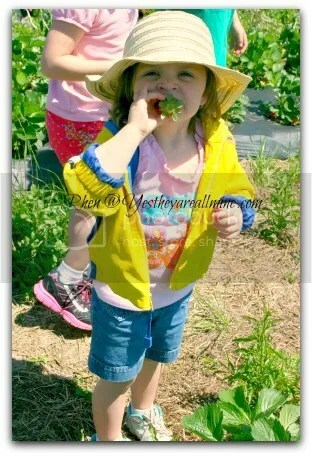 We are a family who loves fresh fruits and veggies, so when the opportunity came to pick strawberries, we loaded up the van and headed to the strawberry fields! I thoroughly enjoyed our little adventure. It was a great morning that rolled science lessons, math lessons, a field trip, a buffet, and a fun time all in to one. We divided the girls into teams of one Big, one Middle, and one Little with a basket and a goal. The boys grabbed a basket and headed off with manly swagger to fill theirs faster than their sisters. It is always a race. Whatever it is, it is always a race! They worked hard, but enjoyed every moment of it. My job was to run the filled baskets up to the “office” and grab an empty one for them to fill. In the picture above, you can see my boys (Israel -2, and Noah -14) roaming the fields eating and picking. I am not sure if any of the strawberries that made it into Israel’s hands were ever put into the baskets. 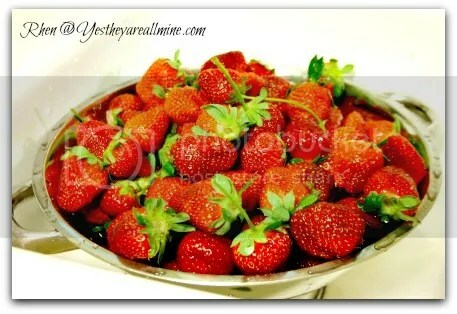 The strawberries were so ripe, juicy, and sweet. 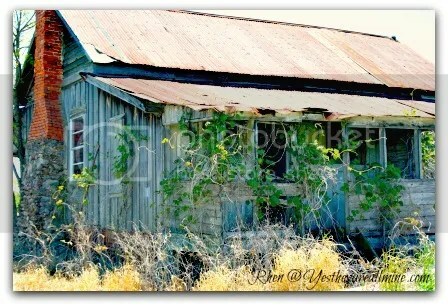 At the top of the fields stood an old shack whose front porch served as the “office”. It fit perfectly with the couple who handed out baskets and took payment. We took our bounty of eight overly full gallon baskets home to process. The little trick of using a straw to core each berry worked beautifully. 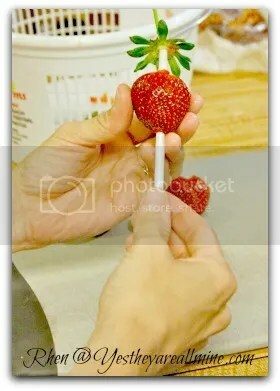 Simply use a clean straw to poke through the berry from the bottom up towards the stem. It will core it and pop the top off with ease. 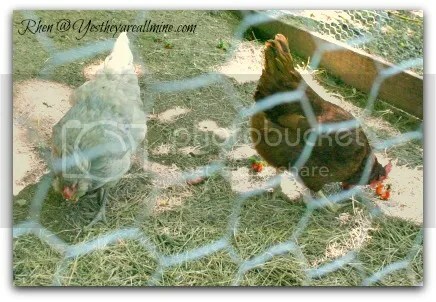 We put all of the tops, cores, and trimmings to the side and fed them to the chickens. They were delighted with their treat! Oh, the happy squawking! I dried 5 trays of strawberries in my dehydrator. The chips will be used in our homemade energy bars. They add nice crunch and flavor. I cut up and froze a large portion of the strawberries to use in cobblers, smoothies, pies, and homemade ice cream this summer. 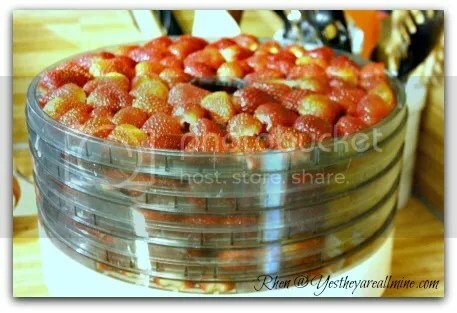 I also attempted to oven dry strawberries as seen in this pin on Pinterest (http://pinterest.com/pin/102527328989401617/). It did not work well at all. 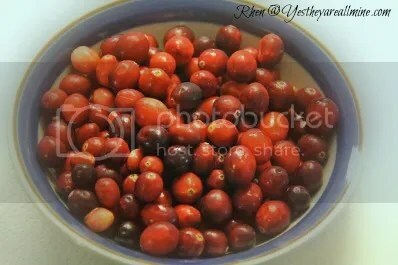 The berries never dried as described and were far too moist to can in jars or bags. Mold would have spoiled them quickly. It is too bad it didn’t work. 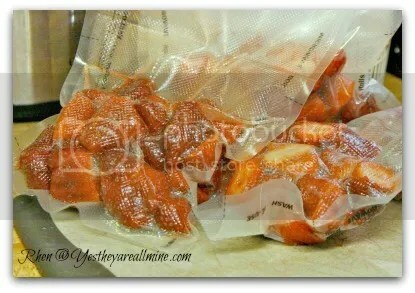 If you try to oven dry them (not dehydrate them into chips), and it actually works, let me know what you did! I am still intrigued by the idea. 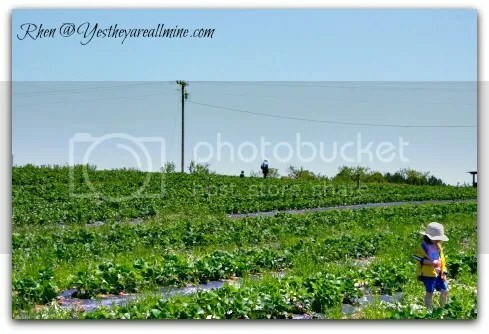 With our strawberry harvest such a success, I am now looking toward our next fruit-filled adventure at the end of the month when we head out to pick peaches! 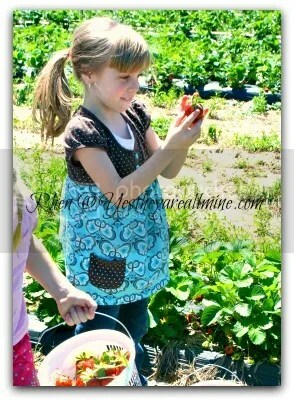 Do you enjoy getting out to the farms and being a part of the harvesting? If you follow me on Facebook, then you know about my recent introduction to the tv show Extreme Couponing. I am intrigued and fascinated by the dedication these people have to amassing great quantities of grocery store items and imitating said grocery stores inside of their own homes. Shelves and shelves, rows and rows, and looming towers of toiletries, drinks, and boxed goods take up whole rooms! While I would never buy most of what they hoard, some of the items have my frugal side perking up and taking notice. Getting toilet paper, paper towels, toothbrushes, hairbrushes, ponytail holders, cottonballs, cottonswabs, and floss for little money or free is definitely something I am interested in! I challenged myself to saving just $15.00 per week. That would be a savings of $780.00 per year. Any money saved about that $15.00 per week is all gravy, my friends. How did my first week go? I saved $26.00! Booyah! Coupons and I, we hit it off quite nicely. So, how did this healthy-eating family save money? Let me share my oh-so-short, yet fun, jaunt into coupons so far. Costco is my weekly grocery store. By simply planning this week’s meals and food stock-ups based on the coupons they are offering this month, I saved $7.00. That was easy! Next, I focused on another store we use frequently, Earth Fare. They offer coupons, put out a weekly specials flyer, and have a point rewards card for shopping there. Just for signing up, I received an organic whole fryer chicken for free. I also was able to grab up an Irish cheese they were offering free this week. Their coupon book had coupons for a couple of items we needed for this week’s menu, and a little perusing on the internet afforded me a couple of manufacturer’s coupons as well. Total saved at Earth Fare, $18.00! While $26.00 may not seem like a lot to some, it is a great step forward and an encouragement to me. Just a little preplanning and checking the internet for sales and coupons to the stores I frequent, and I can save a little cash. That little cash adds up to big cash! Do you coupon? Are you a healthy-eating family who coupons? How is it working out for you? Any tips to help me reach my challenge goal this week? 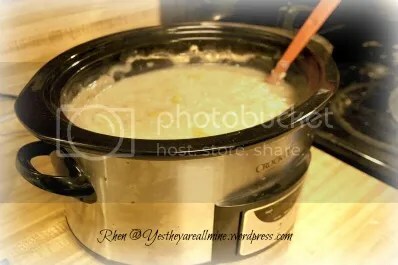 Recently, Brandy (The Marathon Mom) shared a pin on making oatmeal in the crock pot. Neither sounds appetizing, does it? Layer these in this order in your crock pot and DO NOT stir. Cook on a very low setting for 10 hours. Stir and serve in the morning. This is the crock pot full and ready to go Saturday night. I DID NOT stir the ingredients. 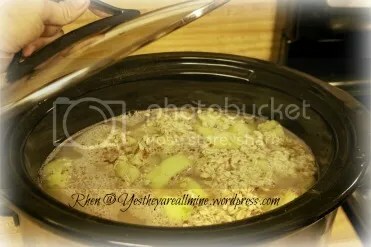 I doubled the recipe, used raw Demerara sugar, and organic Pink Lady apples. It was de-li-cious! Huge hit! Ready to go the next morning! Now, I triple the recipe. Doubling it only gave each person one serving. Most of my kids like to have seconds, even if it is just a little bit. 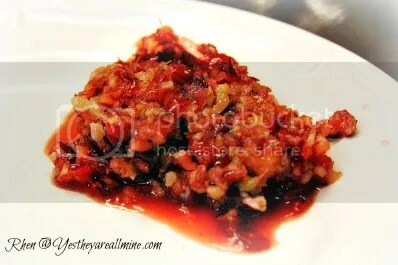 Since then, I have used peaches and blackberries (separately) we harvested and froze last summer. The kids gave both of those breakfasts two thumbs up. Next, I will be trying it with strawberries. Mmmm! What is your I-gotta-get-out-the-door-fast go-to breakfast? Ahhhh, the smell of an apple orchard in the fall. 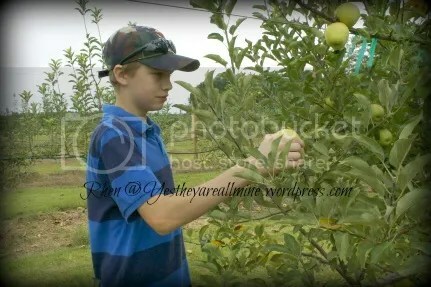 What screams homeschooling in the fall better than a field trip to an apple orchard? Nothing, I tell you, nothing! *Warning* I have lots of pictures to share! 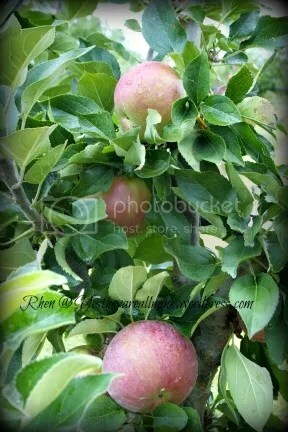 Aren’t the Arkansas Black apples beautiful? They become almost black with a hint of deep red when they are ready to be eaten and enjoyed. Our fantastically fall field trip (say that five times fast) took us to Mountain View Orchards where we were warmly greeted by a father/ son team. 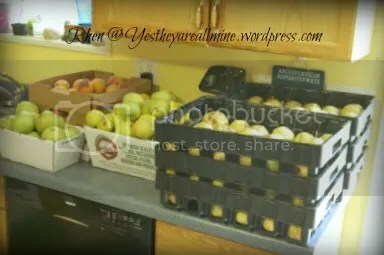 They were extremely knowledgable, very capable in sharing that information with kids of a wide variety of ages, and they were wonderfully generous with their apples and their time. Did I mention they were brave? 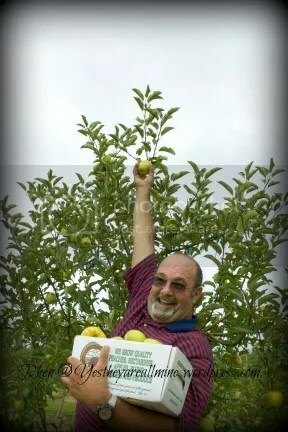 They let us loose on their apple orchard! *grin* Well, actually, the kids were well behaved. The adults, on the other hand… just kidding. We had a great time! 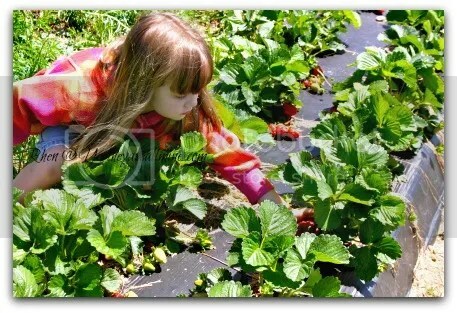 It is not always easy to find a field trip that will appeal to Littles, Middles, and Bigs. Sometimes, if the field trip is fitting for the older kids, then the information that is being shared is over the heads of the Littles. Then there are times that whatever adventure we are on fits the younger children, but it is completely boring for the older ones. 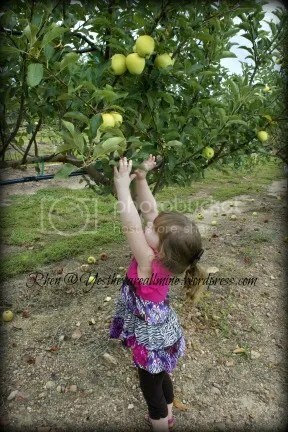 Not so with an apple orchard! 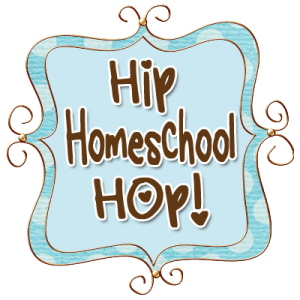 Be still my homeschooling heart! The bouncing bumpy tractor ride back to area of the orchard where we picked wasn’t too long and gave the kids an opportunity to plan their apple-picking strategies with their friends. The children were paired up, I prefer to pair a bigger kid or two with a little one, and given a box to fill with apples. 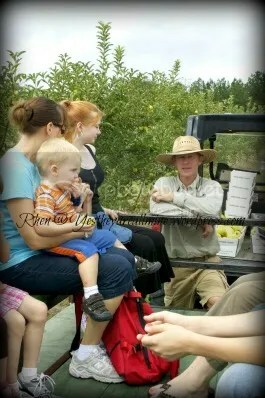 That day we filled multiple boxes with Golden Delicious, that is, whatever apples the children didn’t eat while picking. I told you, the father/ son team was generous! My favorite shot of the day? This one. 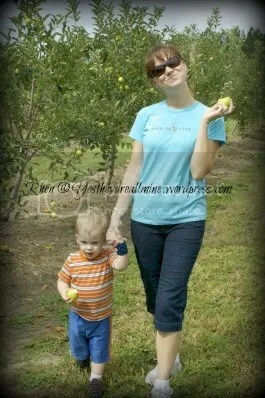 This is Renee’s sweet, sweet friend, Arianna, as she toted Israel’s not-so-light tush around the apple orchard. 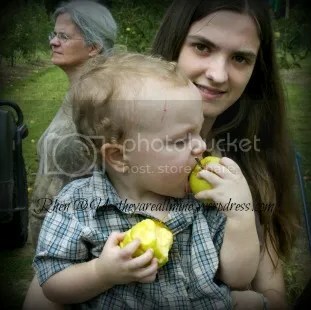 My little man had an apple in each hand. He would take a bite of one apple and then switch his attention to the second one. He consumed every bit of both apples. 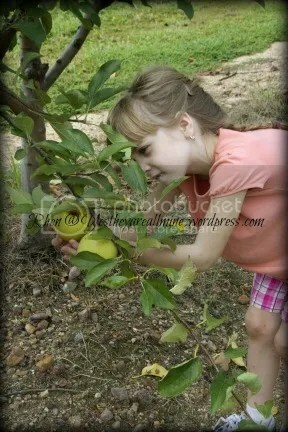 We even brought in grandparent reinforcements for those apples that were way up there in the trees. Reach! Everyone, wave to Paige and her sweet little guy, Gabriel. Israel and Gabriel hang out together every Sunday at church. The cuteness is almost unbearable. Our bounty from the day was enough to fill my counter and keep me busy canning, dehydrating, and freezing fruit for days! 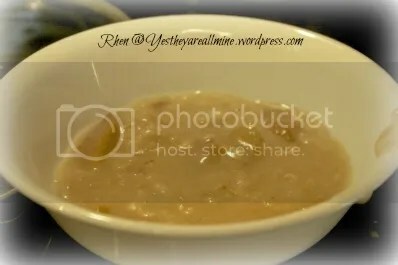 There was much making of pear sauce and Foo. Emily Grace was my right hand girl. 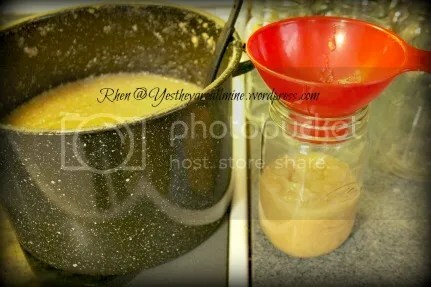 Our pantry has added many quarts of pear sauce, 6 pints of Foo, and 6 quarts of dehydrated apples. These will be yummy and a reminder of warm weather and the sweet smell of the apple orchard when we are in the midst of winter. I shared with you earlier this week that our family’s schedule is becoming a little overfilled and things will be a little crazier than usual. In addition to my fill sensor going on out my washing machine (which means no washer for about 3 days), we are moving! We have been extraordinarily blessed to have found a different house to rent for the time being. There will be more details and pictures coming soon. Until then, I am up to my eyeballs with packing and cleaning and preparing to move in a week and a half. Wow!